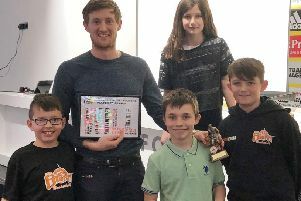 A Rugby League Satellite Club programme has been launched by Hemel Stags as the club looks to introduce youngsters to the sport at an early age. The project specifically targets Year 7 and Year 8 pupils in the U13 age category to increase weekly physical activity and engage new players to rugby league. The scheme runs for six weeks during January and February, leading into the Hemel Stags U13 London Junior League season commencing on March 7. Four teams have been established geographically in the secondary schools in Hemel. To elevate the participant’s experience, some schools have been combined to increase the numbers attending. Grovehill Stags combine Adeyfield and Astley Cooper; Warners End Stags combine JFK, Hemel Hempstead and Cavendish; Kings Langley Stags are a standalone team, as are Longdean Stags. Each team trains one night a week after school and visit Hemel Stags’ Pennine Way ground for Saturday afternoon fixtures. The first fixture was a combination of Warners End and Kings Langley Stags versus Grovehill Stags, with 24 players taking part in a 12-a-side clash. Grovehill scored some good tries, with Harry Whittle in particular using his strength to power through from short range as well as displaying an excellent kicking technique throughout the game. For the Warners End & Kings Langley Stags, Jody Edwards bagged two tries as well as showing good leadership in conducting the defensive line. Another Kings Langley pupil, Elliot Hutchings, showed tremendous talent despite predominantly being a footballer. Direct carries of the ball were taken by the likes of Callum Foley of JFK and Cole Devine of Cavendish, with Callum Earey using the experience gained in several years of Hemel Stags minis to put in clever kicks. Connor McShannon of Cavendish also managed to bump off a couple of defenders to score a try. Overall it was an extremely competitive match which ended in a 20-12 victory for the Grovehill Stags.